Our feet took us 87.7 miles this week! 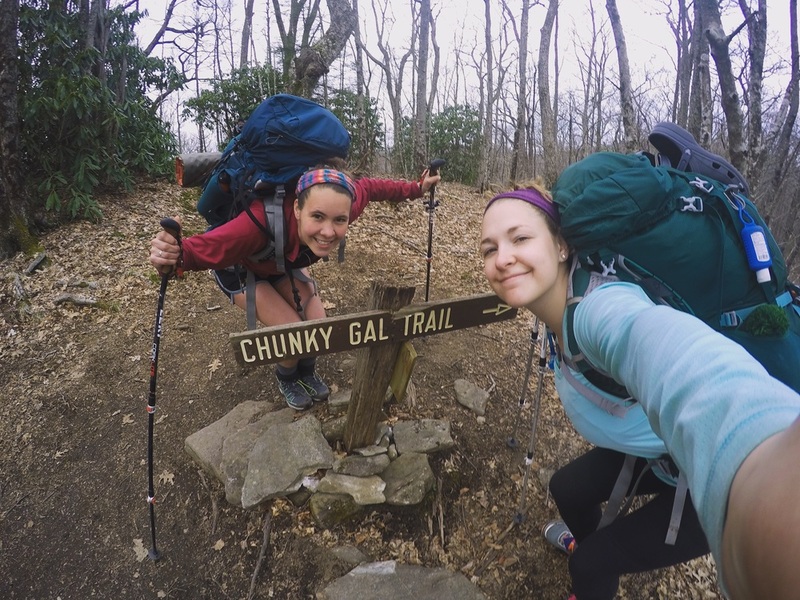 Albert Mountain- the 100 mile mark on the AT! 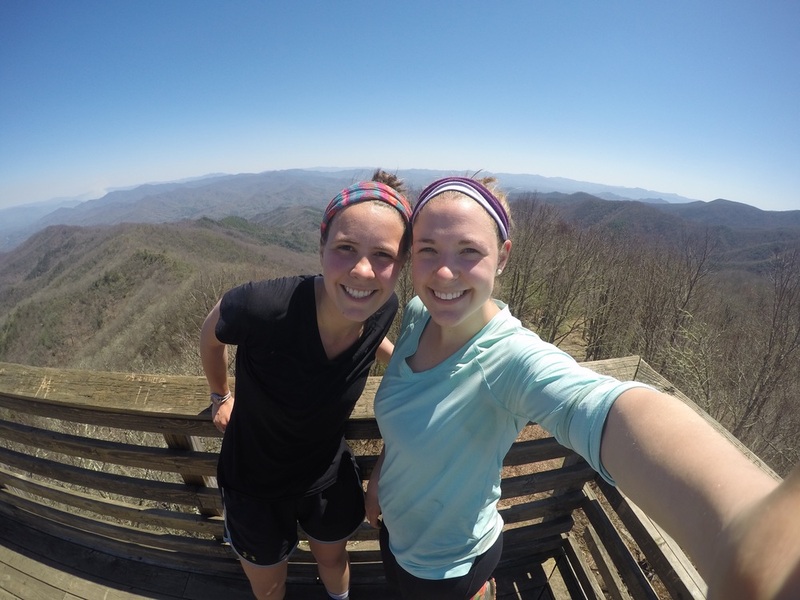 Waya Bald- same outfit, different mountain! After reaching the 100 mile mark on Albert Mountain, we crossed a dirt road with a pick up truck parked close by. We were greeted by the friendliest old man, Rodney, with all the snacks a hiker desires, but can't carry. He offered fresh fruit, perfectly cooked peanut butter cookies (that he baked himself! ), coffee, and orange juice. It was such a happy moment. When we finally reached the Nantahala Outdoor Center (NOC), we could not have been more thrilled (see bummer below). The trail goes directly through the NOC, so it's impossible not to check out what this little village had to offer. There's a cute little restaurant, an over-priced outfitter where you buy things you were convinced to ditch earlier on the trail (I swear, the outfitters have gotta be in cahoots to scam innocent advice-accepting hikers), and an adventure center for activities like white water rafting. Having just hiked almost 19 miles- our longest day yet- we just wanted a cold beer. While wandering around, we randomly stumbled across a group of rafting guides who showered us with their beer and Iowa friendliness! In reality, we saw beers from a mile away and made it to their picnic table by the river in record time. Regardless, they were awesome people and offered us a free white water rafting tour! After taking an unplanned zero day in Fontana Dam while we (im)patiently waited for a package to arrive, we decided to treat ourselves to a dinner at the only sit-down restaurant in the town. We had the best meals that gave us the necessary happy-boost we needed. When finished the feast, our waitress informed us that the kind man, Mr. Hummer, sitting behind us had covered our entire bill! He had always wanted to thru-hike and is an avid hiker and outdoors-lover. We were so touched by his generosity and look forward to paying it forward some day! 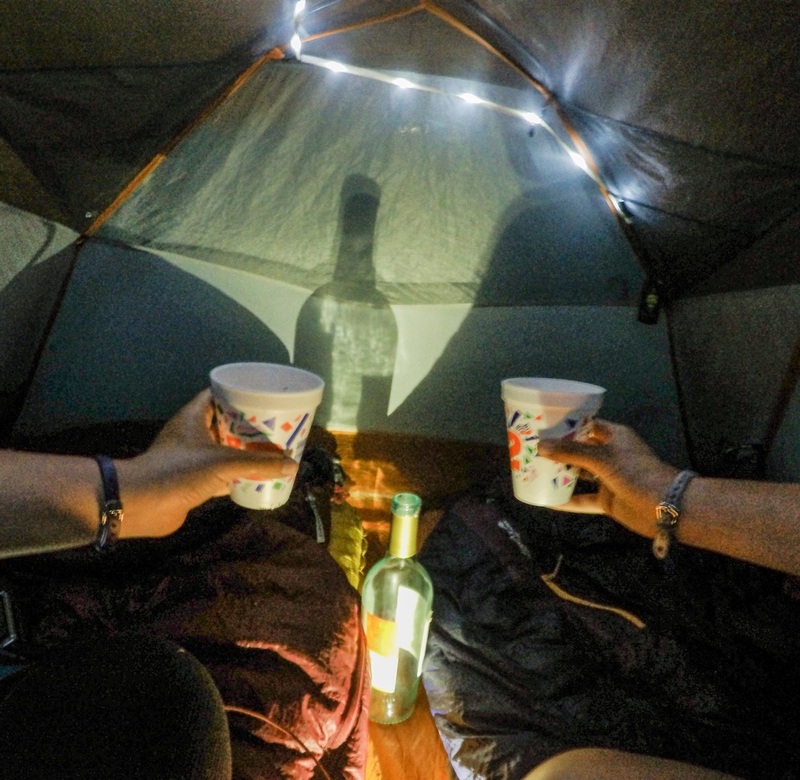 When our package gets lost in the mail and we have to camp in the rain, we don't whine, we wine! Metaphor: Within five minutes of meeting this free spirit, he casually dropped, "...then, on my 13th ayahuasca trip...". How lost must one be to need that many trips to find himself? Metaphor rolled into camp once saying he was "tripping balls from eating a dandelion he saw on the trail". He does him and he's absolutely lovin' it. Mace: In his first week on the trail, Mace was playing around with his bear mace in his hammock and accidentally sprayed himself. Yep. Weeks later he still randomly gets traces of mace in his eyes from his sleeping bag. I fell off the trail for the first time. Danielle and I were making bets on who would be the first to take a digger. We both came close dozens of times but neither of us really ate it til, well, I did. I'm gonna blame it on the pine needles- those things are slippery. I literally just fell off the trail. It was rattling. Luckily, no tears were shed and no injuries were sustained. I have blister-free feet so far (knock on wood)! This is not the case for my hiking buddy, Danielle. The poor girl had blisters the size of Mars on the heels of both her feet and more on her toes. About 10 miles into our hike toward the NOC, her blisters were at their worst. I was like hm maybe we should stop so you can rest your feet. Plot twist: We were about 9 miles from the NOC, a place we could buy cold beer. We hadn't hiked much more than 15 miles in a day, but Danielle didn't even consider stopping for blisters when beer was within reach. She hiked NINE MILES in fricken CROCS for cold beer. The girl is a true hero. Last bummer: Leaving the Nantahala Outdoor Center is quite difficult because the little village has all the luxuries a hiker might want and in order to get out of the valley, you have to hike eight grueling miles uphill. As you might assume, most thru hikers end up staying longer than anticipated. We woke up slow, ordered an amazing breakfast, and lazily made our way to the trail head. Hikers around us were radiating funness- planning white water rafting and drinking beers. A few of them tossed us a beer in a last ditch effort to convince us to hang around another day. We quickly chugged the beers, then decided to move along and hike. Beer and hiking isn't a great combination- especially when climbing 8 miles uphill then another 8 to the next shelter. So this was a bummer of a hike, overall.